For women experiencing a combination of menopausal symptoms, finding ways to alleviate symptoms can become critical. Keep reading to find out how to control your menopause symptoms. 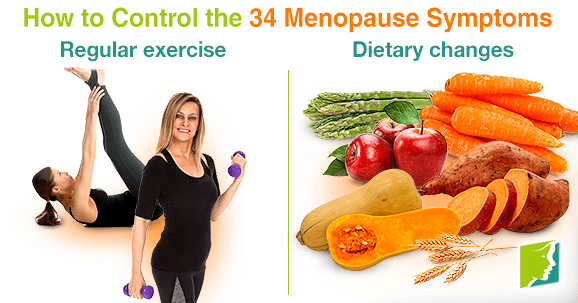 What to Do to Control Menopause Symptoms? Regular exercise. Central to a healthy lifestyle, regular physical activity improves sleep patterns and mood, and can help control night sweats. Stress-reduction techniques like yoga, tai chi, and meditation can also help to control symptoms. Dietary changes. Research shows that consuming more foods high in phytoestrogens, such as apples, asparagus, carrots, sweet potatoes, squash, and wheat germ can help alleviate symptoms. Phytoestrogenic supplements contain estrogenic components produced by plants and have estrogen-like effects which can counteract hormonal imbalance. However, introducing artificial hormones into the body can lead to the body producing less estrogen, making symptoms worse if you stop regularly taking the herb. On the other hand, hormone-regulating supplements stimulate the hormone producing glands in the body instead. Hormone-regulating supplements nourish the pituitary and endocrine glands, causing them to produce their own hormones more efficiently, which results in balancing not only estrogen levels but also other important hormones like progesterone. If your menopausal symptoms are severe consult your doctor. Always research any herbs or alternative remedies before taking them to see if they interact with medications your currently taking. Read all about natural ways to relieve menopause symptoms so that you can go back to living a symptom-free lifestyle. Dong Quai: How Does it Work for Treating Menopause? Native to the mountains regions of China, Korea, and Japan, dong quai has been used for centuries for women's health problems, including menopause.